Brambletye Hotel01342 824144work01342 770191fax HotelBrambletye Hotel is in the village of Forest Row next to Ashdown Forest. Well equipped en suite rooms including a family suite. Welcoming bar and restuarant offering local food. Large free car park, free WiFi throughout, patio areas. Here you will discover an historical atmosphere steeped with charm and hospitality. Located in the heart of Forest Row, surrounded by Ashdown Forest, the property was featured in the Sherlock Holmes novels. 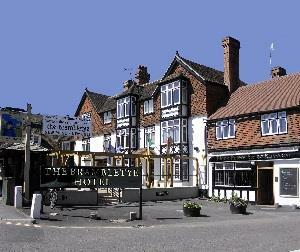 Brambletye Hotel is in the village of Forest Row next to Ashdown Forest. Well equipped en suite rooms including a family suite. Welcoming bar and restuarant offering local food. Large free car park, free WiFi throughout, patio areas. Ideal for the country lover or angler or as a central point from which to explore Sussex and the many historic towns and places of interest nearby.